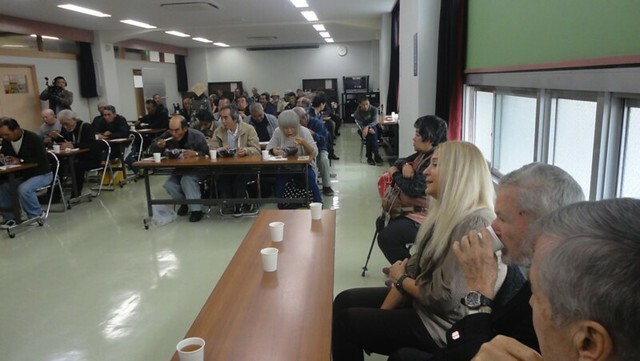 The Japanese TLIG group invited Vassula to deliver three speeches in three Japanese cities. Our long journey to Japan began on the morning of October 26th. After changing many planes, we eventually arrived in the country of the “Rising Sun”, distant Japan. At the Tokyo airport, we were greeted by familiar people who we had previously met at the pilgrimages and the spiritual retreats of TLIG. 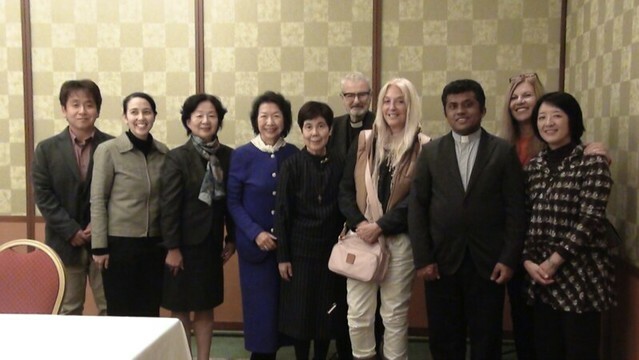 The entire Japan TLIG prayer group in Tokyo met us at the airport. Faces full of joy and enthusiasm welcomed Vassula to their country, after a long time. Our hotel was located at the centre of Tokyo, very close to the hall where Vassula was to speak. After such a long journey, we needed some rest. Vassula visited the volunteers at the meal preparation room. 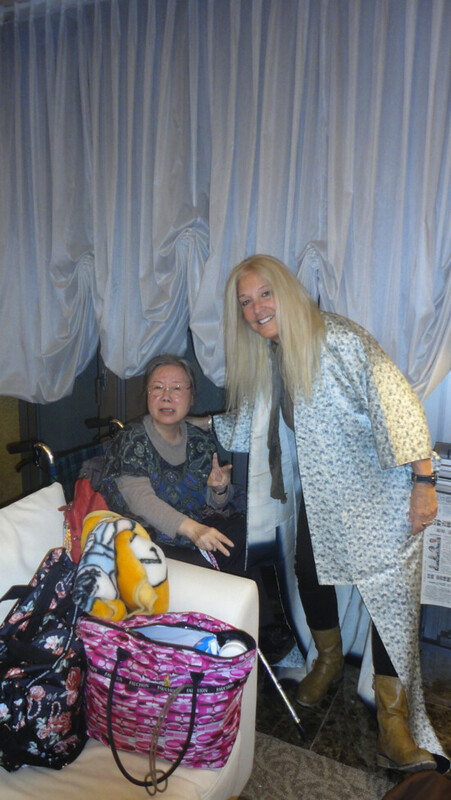 The next day we visited the Beth Myriam in Tokyo. Hans, Belle and Satoru, our TLIG friends, took us to its food preparation area. It was a small room next to a parking lot. Outside this room, there was a heavy-duty trolley. The ladies were preparing a meal that smelled wonderful. Vassula listened attentively to the women, as they showed her the dishes they had prepared for the poor in Beth Myriam. Father Heinrich Jokiel was also there and had a short conversation with Vassula. Father Heinrich is a Jesuit priest, advanced in years, and as everyone has said, he supports the TLIG messages and Vassula 110%; he proved them. 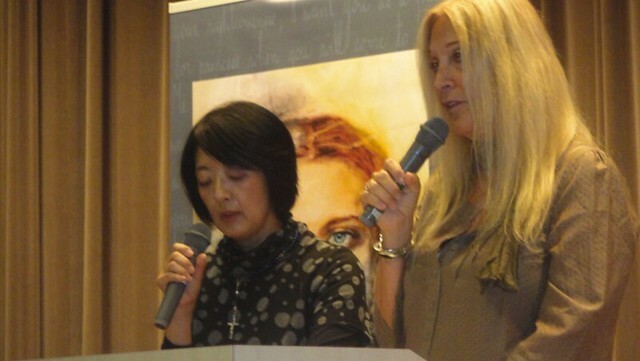 He followed Vassula’s program throughout her stay in Japan, and travelled with her to the next two cities where she gave her testimony. After the food had been prepared, we all took it to an adjacent local community space which was rented by the Beth Myriam coordinators for a small charge. Ahead of us was Belle with an icon of Our Lady, followed by the people pushing the trolley and the rest of the happy group. We then arrived at the place where the poor are fed. The whole group was working like ants, arranging the tables, washing them and preparing everything for the meal. 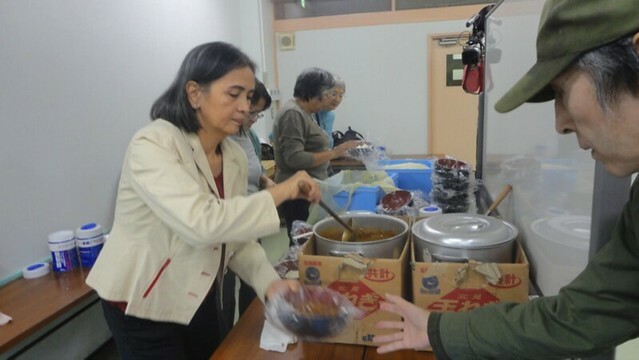 Along with the group, there were two poor people who were initially fed like the rest, but then wished to contribute by taking part in the preparations. Lunchtime was approaching and the people began to arrive. Approximately 80 people, in a very orderly manner, took their seats. The ladies were filling the plates while the rest served themselves the hot food and their favorite tea. They offered us each one serving. Satoru got up and, after reciting a prayer, invited Vassula to talk to those present and say a few words. Vassula said: “I am happy to see you all here. I have only seen you on video, but now I am also seeing you in person. She spoke briefly about the 30 Beth Myriams all over the world. 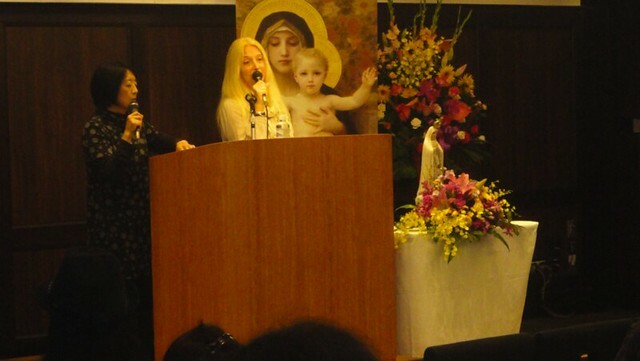 She explained how they were established following a vision from Our Lady, where she asked for food to be offered to our helpless fellowmen, in addition to the spiritual nourishment. We shared the delicious food. Before they departed, they were also given an additional serving to take with them. Some of them had read the TLIG messages and approached Vassula to have a photo taken with her, or to have their books signed. As always, Vassula was happy to do so, asking them a few questions about their condition and their family. After the crowd left, everything was collected and the place was cleared quickly and neatly. The House of Mary in Tokyo is the fruit of conversions that took place through the TLIG messages. They are the outcome of the seeds that fell and thrived and their fruit now feeds many. They are those who, after reading the messages, try to experience them and put them into practice, giving joy to the Lord and making reparations to compensate for the evil committed today all over the world. It was now time for a cup of coffee… and the wish to spend some time all together. When asked how we could spread the Lord’s message, Vassula replied that it is the power of God, the power of His Word in Itself that spreads it everywhere, and she mentioned as an example something that had happened in Canada. While she was reading a message at one of her meetings, people kept falling off their seats. So great is the power of the Word of God. And she went on to say that those who do not believe are the ones who have not read the messages. Upon reading the message, each soul recognizes the voice of his/her Creator… Many TLIG readers testify that reading the messages touched them deep, which was manifested in different ways for each one. At the hotel a little later, Vassula was visited by a woman who was one of her younger son’s neighbors while he was studying in Japan. This lady had become ill and her daughter brought her in a wheelchair. She offered Vassula a traditional kimono as a gift. The meeting was a pleasure for both of them, as they had not met in a long time. Vassula anointed her with oil and blessed her with the Cross containing holy wood. Vassula could never forget how well they had treated her son and herself. 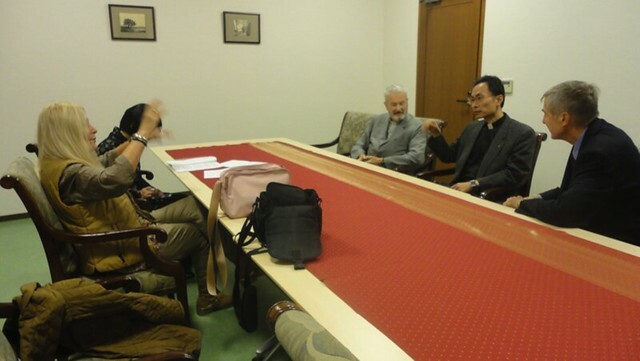 At the Jesuit monastery the next day, Vassula met with Father Heinrich Jokiel and Father Ryuichiro Hanafusa, who participates along with Keiko in translating the TLIG messages into Japanese. Vassula’s speech was delivered at a St. Joseph's hall, behind the St. Ignatius church. 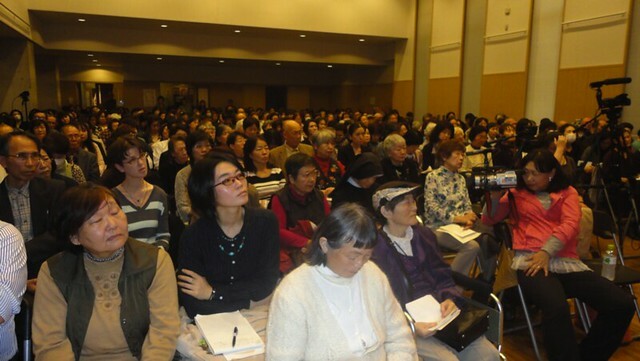 The room was filled to capacity with many people standing; there were about 450 people in all. The meeting began with the Our Father in Aramaic, which had been handed out so that everyone could take part in reciting it. Vassula spoke about the early days of the messages. She mentioned short daily stories of her experiences in which the Lord taught her and in turn, teaches us with humor and kindness about intimacy, how we can remember His Presence, how sad He is when we abuse the freedom he has given us and how we distort our image which is His image. She stated that he is coming to wake us up from our lethargy and our laxity; that is why He is sending His Holy Spirit to everyone, even though we do not deserve it. Just as a flower cannot live without water, so the soul cannot live without the Holy Spirit. She then went on to read extracts from the TLIG messages. 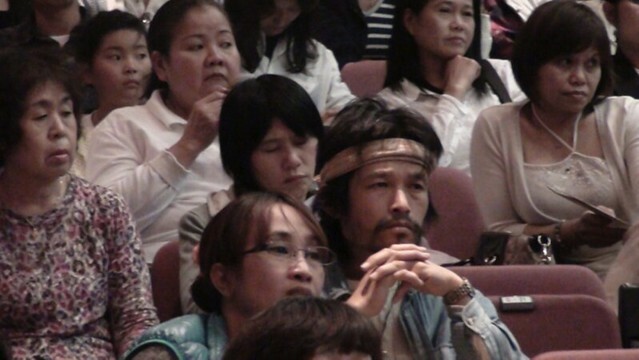 The ambiance in the room was deeply spiritual and the audience listened attentively, taking down notes. Many of those present were listening to Vassula speak about the TLIG messages for the first time. 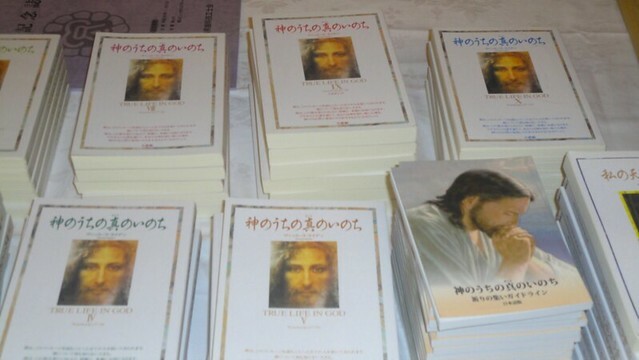 They showed a great interest and purchased the TLIG books, making particularly heartfelt comments. Later on, mass was celebrated at the St. Ignatius church, where Father Heinrich, pointing to the TLIG book, said that even today God is sending his prophets to the Earth and discussed the great need for repentance in today’s world. The following day we set off for Koriyama, situated in Fukushima. In 2011, the region was badly hit by the well-known big earthquake and the tsunami that followed, resulting in the disaster of the city’s nuclear plant. It is an area populated by 1,980,000 people, lying at the northeast part of the country. It is one of the first areas where Christianity was mentioned in the sixteenth century. 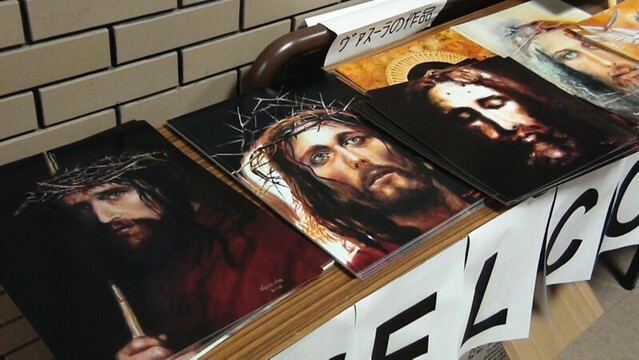 Many became martyrs and they are known in the church history of Japan as the martyrs of Aizu. In this area, Belle and Tessie, who are readers of the TLIG messages, began talking to the Philippino community about the TLIG Messages and Vassula’s mission. The fruit of their testimony was the establishment of three TLIG prayer groups. These prayer group members invited Vassula and organized a meeting for her. At the train station, the organizers and the members of the prayer groups welcomed Vassula with joy on their faces for the great grace of God in having His envoy visit their suffering city! 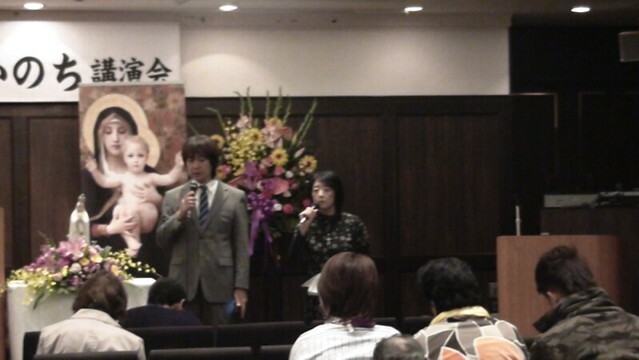 Satoru introduced Vassula and Keiko interpreted the speech as Vassula spoke. the urgent need for repentance, stressing the fact that the fruit of repentance is love. Love is God’s will. At the end of the speech, there was a prayer for healing and deliverance. The priest and Vassula with her cross prayed for all of those present. After this event, we said goodbye to TLIG friends and boarded the bullet train as it is called, which travels at 350 kilometers per hour. After a journey of approximately two hours, we arrived in Tokyo, where we spent the night. The following day, we departed from the Tokyo airport for Yonago, where Vassula’s final speech in Japan would be delivered. 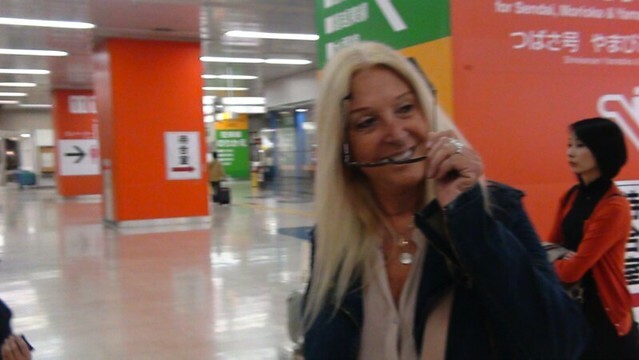 At the airport, as always, the TLIG organizers had been waiting for us. Apart from the interpreter, Father Heinrich had remained with us for this trip. 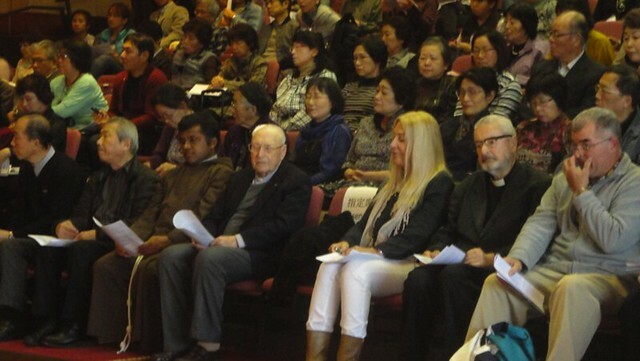 Nancy, one of the TLIG readers, informed Vassula that a large part of the audience would probably be non-Christians and that it would be the first for many people to hear about TLIG messages. In addition, most of them knew nothing about Jesus. After we had settled into our room, we left for a scheduled meeting with some priests; this meeting would take place a short while before Vassula’s speech. Seven priests attended the meeting: Father Jokiel, Father Daniel, Father Masakawa, Father Johnson, Father Nishie, Father Goto and Brother Ludo. Their joy about the meeting was manifest. 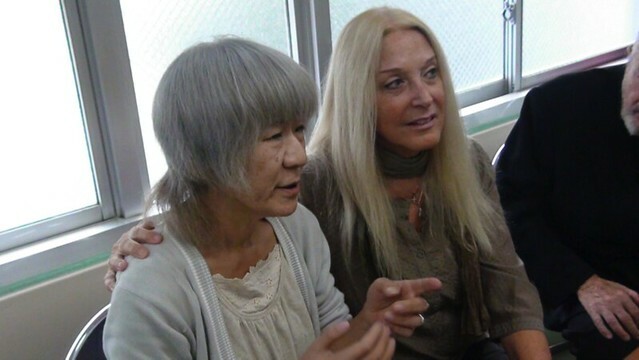 After they introduced themselves, they spoke about the way each of them had become acquainted with the TLIG messages. Then there was a discussion between them and Vassula about the healing prayer that would follow the speech. After this meeting, we were taken to the conference hall where everything was ready. About two hundred people had already gathered there. Shery introduced Vassula and her mission, in both English and Japanese. A sign-language interpreter, brought in for a deaf-mute, also attended. A young lady sang a beautiful song, creating a spiritual atmosphere for what would follow. Vassula discussed the many issues contained in the TLIG messages. First of all, she mentioned the sweetness of the heavenly Father, His Mercy and His Tenderness. Regarding sin, she said that small sin or big sin; all of them are sins in the eyes of God. She stressed the fact that each one of our merciless acts, hardness of the heart, hostility, and pride of calumny will count when we come before Him. At the end of her speech, as in her previous testimonies, everyone rose and devoutly read the prayer of healing and deliverance that Jesus has given us. It was a particularly intense, spiritual moment, filled with devotion and respect, since most of those present heard about Jesus, perhaps for the first time in their lives. Following this healing prayer, there was a final prayer and a blessing for everyone present. A chorus of young women was singing hymns throughout the prayer session. Works created by Vassula to support the Beth Myriams. The following day, we had ahead of us a long and difficult journey back home, which lasted 24 hours in total. Our Japanese friends, who took us to the airport, told us that towads the end of Vassula’s speech a meteor fell into the sea nearby. We know that prayers, our communication with our Heavenly Father and His power protects us and wards off all evil! 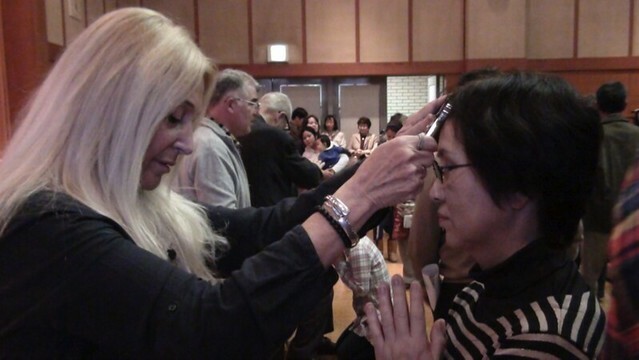 We pray that the TLIG vines increase in Japan; that the eyes of those who cannot see the signs of God open; that the ears that can no longer hear open, and that their spirit cultivates what the Lord has planted through the witnessing of His envoy, so that they convert and glorify Him. “I was surprised to see that more than five people fell down to the ground. I think the people who didn’t fall down and my friends also received the invisible Grace of God. I am going home with great gratitude."